What Role Should Slang Play In Your Next Speech? When we construct a speech, all that we really have to work with are words. That’s why the words that we choose to use are so important. If we choose the correct words, then we’re going to be able to capture our audience’s attention and hold on to it. If we choose the wrong words, then we’ll never have a chance. The reason that you might want to consider using slang in your next speech is because the words that make up slang can add gusto to your speech. View slang words as being a sort of spice that can make any speech tastier. However, you also have to keep in mind that too much spice can make any meal not taste so good. Slang has always been viewed by public speakers with a bit of distrust. We view slang as being those words that are understood by a lot of people; however, at the same time they are not accepted as examples of good or formal word usage by the majority of people. What this means is that we view slang words as being just outside of what is proper. However, at the same time most of us could not communicate clearly without using some form of slang. What I believe that a lot of us don’t fully understand is that slang has been around for a long time. Slang has been a part of all known languages over time. People who research such things have found evidence of slang in India’s Sanskrit writings. Even William Shakespeare used slang in several of his plays. There are a lot of different reasons why we tend to use slang. One of these reasons is because people enjoy variety and novelty in both their lives and in their words. The reason that we are always creating new slang is to satisfy these urges. When we are giving a speech, one of the most difficult things for us to accomplish is to form a connection between us and our audience. This is where the real power of using slang in a speech can come in. When we work some slang into our speech, it allows us to find a way to break the ice with our audience. By using slang, we are able to shift the delivery of our speech into a more casual and friendly tone. When we can accomplish this, we have a much better chance of getting our audience to accept both us and the message of our speech. Let’s face it, some of our speeches can come across as being both long and boring. Although we may have a great deal of information that we’d like to convey to our audience, we don’t want to lose them by boring them. Once again, this is where slang can come to our rescue. In a business setting, if we work slang into one of our speeches it can come across as presenting our audience with a sense of playfulness that can help to retain their attention. Since our goal is always to find ways to hold on to our audience’s attention and all that we really have to work with are words, the real power of slang comes from the fact that slang presents us with fresh figures of speech. One of the reasons that slang terms are so powerful is that they have the ability to create lasting word pictures in our audience’s mind’s eye when we use them. A lot of the slang terms that are available for us to use are in some way related to sports. The reason that there is such a tie in between these two areas is because they involve comparisons. Slang and sports comparisons are talking about competitions in which some form of team effort is going to be required in order to be successful. This lends itself to the creation of new slang terms. In the end, as speakers we need to realize that slang is a powerful tool that we can use and that it allows the language that we are speaking in to stay alive and to continue growing. When we sit down to create a speech, we often start to think about what we want to say in formal terms. However, there’s a good chance that we may be missing something here. If what we’d like to be able to do during our speech is to find a way to connect with our audience and share the benefits of public speaking, then perhaps we need to lighten things up a bit. Perhaps we should start to work some more slang into our next speech. Any discussion of slang requires us to understand just exactly what slang is. It turns out that slang is words that are understood by a lot of people; however, at the same time they are not accepted as examples of good or formal word usage by the majority of people. Slang is not something new. It’s been around for a long time and it has always existed in many different languages. Using slang in a speech allows us to break down the barriers that exist between us and our audience. Using slang in a speech makes us come across to our audience as being more casual. 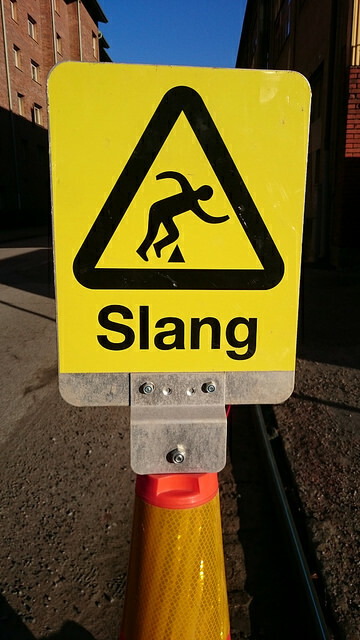 Slang can be use in a business setting in order to keep and retain our audience’s attention. Slang’s ability to help our audience build word pictures in their mind can help to make our speeches unforgettable. As speakers it is our obligation to become aware of all of the resources that are at our disposal when we go to create a speech. One powerful tool that we have is the ability to work slang terms into a speech. By doing so we will make our speech more colorful and we’ll have a better chance of engaging our audience. The next time that you create a speech, carefully pick what slang terms you want to add to your speech. Doing so just might turn your regular speech into an unforgettable one. Question For You: Do you think that it is possible to include too much slang in a speech? When you are creating a speech, how do you go about coming up with what you want to say? If you are like most of us, you spend some time looking things up, you might consult a book or two, and then you get busy writing your speech. However, this is where things can start to get a bit tricky. When you are writing that speech, are the words that are flowing out of you yours or do they really belong to someone else?